...superheroes are usually found in comics. And parents want kids to read books. Plus, superhero comics are often too violent for younger children. 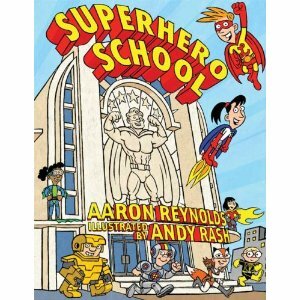 Superhero School, by Aaron Reynolds, is just such a book, and it's terrific. Protagonist Leonard is a kid with super-strength and super-speed. When he gets sent to superhero school, he can't wait. He looks forward to learning how to stop trains, and bend iron and clobber bad guys. 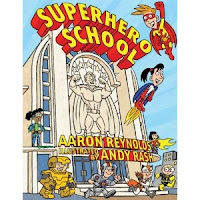 So he's more than a little disappointed when the teacher at superhero school teaches them boring stuff like fractions, and division instead of flying and clobbering. But when the ice zombies kidnap the teachers and threaten to take over the world, Leonard and his classmates sure are glad they have the math skills they'll need to divide and conquer! A terrific book, with a nice twist that kids might not see coming. The illustrations are quirky-great; there's only one illustration of clobbering and it's just silly rather than violent.